THE entire creation started off with love. The creator modeled humans in his image coming up with Adam and Eve. He created them with love and gave them a heavenly place to live in that had the good stuff as well as the necessary evils. There are many twists to the tale but probably a snaky (or sneaky) salesman sold Eve an apple peeler. Adam suggested, "Well, what's the point of having an apple peeler if you don't peel apples?" So off they went to the forbidden tree in the forbidden garden to have a forbidden apple. And the price of such forbidden trespass was that they were sent to earth where they would have gardens that other people would trespass into. That would teach them a lesson. Basically, love can come up with a lot of good things as well as get you into a heap load of trouble. Seems like love itself has trespassed into everything. Just look around and you will see traces in literature, history, music and day to day life activities. It adds depth to the instances of pain and happiness. Without love everything would be empty and meaningless much like an apple pie without the filling. Love comes in different forms such as the platonic where it's more like window shopping for apples. You look but don't bite. Then there is the physical love or better known as lust. And finally there's the type that many yearn for but few find. True love encompasses all that is good wiping away any opposing factors like money, wealth, riches, bank balances and big diamond rings. So, money is a big thing but love also looks beyond other problems like body weight, in-laws, height and hair (too much or too little). A man and a woman (and other possible couple combinations) look at each other, fall in love and in many cases want to spend eternity together. Of course, eternity could have different time spans for different folks. In the ages past we have seen wars being fought for the love of a person. There are tales of people throwing aside religion, culture and royal riches for love. During the Renaissance the term blind love evolved where you loved for nothing else except just wanting to love. It was more like love at first sight where you don't know anything about someone else but fall nevertheless. In our culture love and romanticism had a special ritual. A boy and a girl would exchange letters and handkerchiefs (without blowing their noses on them). The girl would pace apprehensively near the window or balcony while her guy would be out on the streets waiting for a glimpse. Of course, the parents would eventually find out and in most cases the girl would be married off somewhere else while the boy gets a thorough introduction to physical pain through fists and sticks. Sometimes the couple would sneak out to get married. Marriage seemed to be the culmination of all the love and accompanying pain. Western cultures are now sneaking their way (like the snaky apple peeler salesman) into all other cultures. Ours is no different. Love seems to have less depth of feeling now. When a person falls in love he/she looks for dependability in the other person. People now spend a lot more time to look for the elusive true love. As a result the notion of culmination of an affair into marriage has changed drastically. Blind love has given way to a more slow and cogitative approach. Nowadays love starts off mainly from acquaintances be it a friend, classmate or colleague. It evolves to a deeper relationship that does not necessarily lead to marriage. The head rules over the heart in a love where there is a lack of empathy and understanding. People keep searching. In this millennium age the sneaky west again leads the way with mutual attraction leading to love which leads not to marriage but to a phenomenon known as living together. Loving till eternity has given way to love till something comes up. Some believe that staying together in a marriage for so long leads to boredom and insanity. It's like having apples all day, everyday, forever. Others feel that living together gives them an opportunity to figure out what the other person is like. 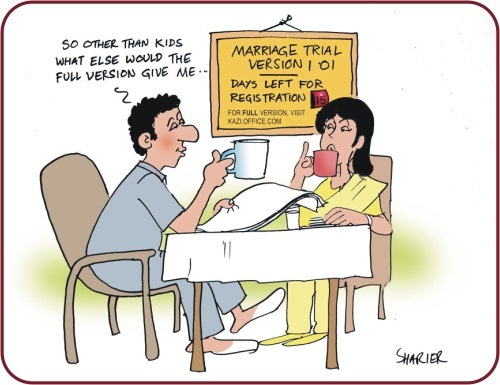 It's more like a trial version marriage where you give it a shot for a certain period and then get a new version. Sounds cold but that's reality. Couples want someone with a similar mindset to help them go through life. They want to face lifes troubles together. So why bother with all the complicacies of a marriage and legal paperwork? Mistakes can happen in marriage and it can fall apart. It seems easier to live with someone for a period rather than marry over and over. After all, very few people want to emulate actress Liz Taylor's record of eleven marriages. On the other hand few want to spend 40 years in marriage like Nelson and Winnie Mandela just to separate in old age and start all over again. In almost all the societies there is the act of going against the norm of marriage. In the west it's an open fact. People even announce over parties that they plan to live together. After all, it has all the needs of trust, reliability and care that a person can expect from a companion. In theory it leaves out manipulation or physical and mental torture. It's so much easier to walk out of. It's a different story in our society where social norms look down upon such behavior. Despite that many people are still living together, albeit in secrecy. In most cases the couples have to leave friends and family just to be together on their own. Couples hide it fearing what others have to say. Take for example the case of Mithila. She worked at a private bank as a chartered accountant. During her college years her family fixed her marriage to a friend of her brothers called Nafis. Because the two families were so close it took little time for the couple to get close. In fact, they were together all the time even going on trips for shopping and spending all day together. At times, Mithila even stayed over at her future in-laws house. Being the only daughter, Mithila was of a rebellious character. She pretty much got her way. Nafis was her opposite, preferring to lead life quietly and believed somewhat in the traditional ways. Mithila would go out at any time with her friends for dinner or simply hanging out. Nafis did not like this feeling she should not go out just like that without him or without his permission. The girl did not like this possessive attitude one bit. The relationship ended with Mithila moving on to work elsewhere. There she meets Abed. To make a long story short they met, met some more and liked what they saw. Abed lived a single life in a flat. Mithila moved in and they have been together for three years. In their words, they don't want to ruin their relationship by tying it up in a word called marriage. They don't want to remain tied down when just because of a legal agreement if and when things go bad. They say the trust, love and mutual understanding is all there right now as is. A man and a woman sometimes have a strong magnetism that makes them want to be with each other al the time. When it starts to fade a little the anxiety goes up. Love becomes a fleeting moment. In other words there is no such thing as true love or so some believe. Tania worked hard as looking after the family fell on her shoulders. As a result when it was time for her to get married no one really noticed. She was busy and so was everyone else. Besides, Tania herself did not consider marriage a viable option. According to her, too many couples were getting married in the morning, fighting in the afternoon and getting divorcing by evening. She earned a good job that required attending many seminars and workshops. In one of these she met Rubel. It was love at first sight as her attitude won him over. He also agreed to her views on marriage. They wanted to live life as lovers and not as husband and wife. Having passed 40 they feel life is to be lived as wished. The interesting thing is that they work great distances apart. One is in Dhaka while the other works in Chittagong. Whenever they feel they head off to each other and spend some time together. For them it is like Rabindranaths fable of Amit and Labanya. Their love has no boundaries. But love also deals with trust and security. Marriage is a sacred tie. Insecurity about the partners feelings can lead to all kinds of trouble. This is the basis for another couples logic supporting living together. They believe that insecurity would ruin the sacred veneer of marriage. Rumi and Saif are in a two year relationship where they plan to live together in the near future. This way one cannot dictate over the other regarding chores and personal wishes. Ego is the prime mover and shaker here. In our society male chauvinism is prevalent and women are supposed to bow down to men. According to the couple they can prevent this by living together. Different people analyze and define their relationships differently. From the viewpoint of law and religion, living together can be a crime or at the least, disagreeable. Arguments are there for both sides. There are those reading this article thinking such an issue is ugly and disgusting. 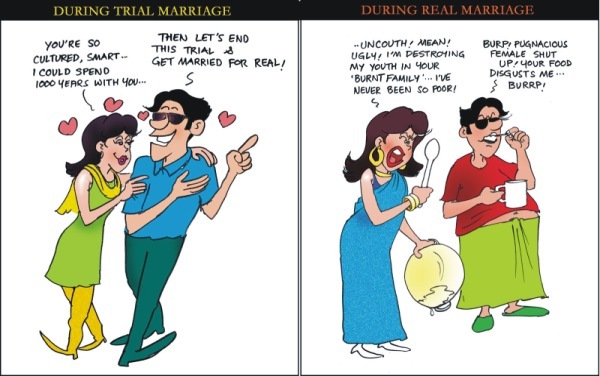 But then again there are many ugly things happening under the cloak of marriage. There are people who change lovers every day. Marriage does not stop them, what with extra marital affairs. Is it better than living together? Whatever may be the case, this phenomenon is starting to sneak its way in. In this day and age love is measured like a commodity and only then it is decided where and how to keep it. The new generation will gradually swallow this as they do everything else. Whether this issue is a bad apple or not is yet to be seen.